23 chansons d’inspiration religieuse et amoureuse pour découvrir la vitalité de l’anglo-normand, langue de prestige et de culture du XIIIeme siècle. 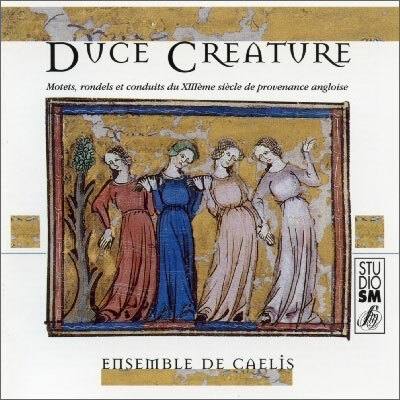 Duce Creature underlines the influence of the School of Notre-Dame de Paris on the English repertoire of the second half of the 13th century. It demonstrates the particular way in which the English received and modified this innovatory French style. Several original pieces were probably written by local composers; amongst these are the priceless Anglo-Norman motets. The Anglo-Norman language was imposed by William the Conqueror in 1066 and inspired many literary works of high quality. The smiling mysticism of the period allotted a particular place to the Marian cult, as can be seen from the number of works dedicated to her on this recording. De Caelis has made a particular point of faithfully respecting the pronunciation of the clerks of the period; the ensemble brings both warmth and sensuality to these elegant songs inspired not only by religion, but also by love. With the financial support of the ADAMI, the SCPP, the Caisse des Dépôts et Consignations and the Département de l’Orne.